For Kabab Masala , dry roast cumin ( jeera), Whole coriander ( dhonia), Cardamom ( elach), cinnamon( Dalchini), cloves ( lobongo/long), black pepper, nutmeg ( jaifol), mace (javetri),fennel ( sauf/mouri), dry chili together and grind them into a smooth powder. 1. Marinate the chicken with all the ingredients mentioned above for marination for at least 1 hour. The longer you marinate , the yummier it is. 2. Make the batter with all the ingredients mentioned for batter. Make a medium thick batter. It shouldn’t be too runny or too thick. But Consistency should be thick enough to cover the chicken. Take out the chicken cubes from the marinade and put into the batter. 3. Heat oil and deep fry the pakoras on medium low heat. the longer you fry . the crispier the pakora will be. 4. Serve with your favorite dip or sauce. Take 2 tbl spoon of Mayonnaise and 2 tbl spoon of plain yogurt. Mix well, add little sugar, finely chopped garlic, a pinch of mustard powder ( optional) and sprinke little salt, if needed.. . You may add chopped mint if you like….. Yummy and creamy!!!!!!!!!!!!!!!!! 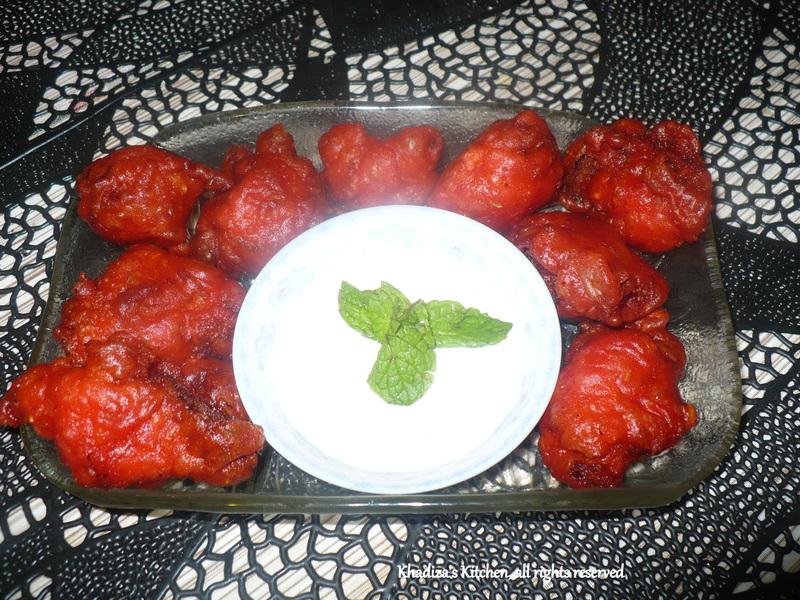 This entry was posted in Chicken, Chicken and Poultry, Glossary / Notes, Snacks, Snacks and Lighter Fare and tagged Chicken Pakora, Chicken Recipe, Pakoda, Pakora, pokora, Snacks recipe. Bookmark the permalink.